Alnus incana is a multi-stemmed shrub to 10 m tall, colonial, shallow-rooted; roots associated with ectomycorrhizal fungi (Berliner and Torrey 1989); winter buds stalked; bark brown with prominent, orange to white, warty lenticels, about 0.7 cm long. Leaves to 12 cm long, oval-elliptic widest near or below middle, tip blunt to pointed, base blunt, margin irregularly double toothed, pale and waxy below, hairy on veins, 8-14 conspicuous major veins per side, parallel, impressed above; margin irregularly double toothed to nearly lobed (leaves never green into late Autumn); leaf stalks orangey. Flowers in red-purple catkins, sexes separate, male flowers in long, loose, dangling spikes (catkins) to 12.5 cm on red stalks; female catkins much shorter, dark red, about the same size and color as leaf buds (Fewless 2006); blooms March. Fruiting spike cone-like, woody, dark, 1-2 cm long, almost stalkless, fruits tiny nuts, often narrowly winged, about 0.3 cm wide, Wind dispersed, Aug., Sept.-Feb. Seeds eaten by some songbirds, twigs and leaves eaten by rabbits and deer (Martin et al 1951). Frequency in NYC: Infrequent, if present. Possibly misidentified and not found in NYC (see Cornus sericea). Habitat: Open, undisturbed freshwater wetlands. Prefers soil pH 5-7.5 (USDA, NRCS 2006). Tolerant of poor soil, pollution, flooding and soil compaction. Moderately tolerant of salt. Intolerant of drought, shade, index 0-2 (Hightshoe 1988). Very intolerant of shade. Sensitive to ozone, salt and drought (Hightshoe 1988). 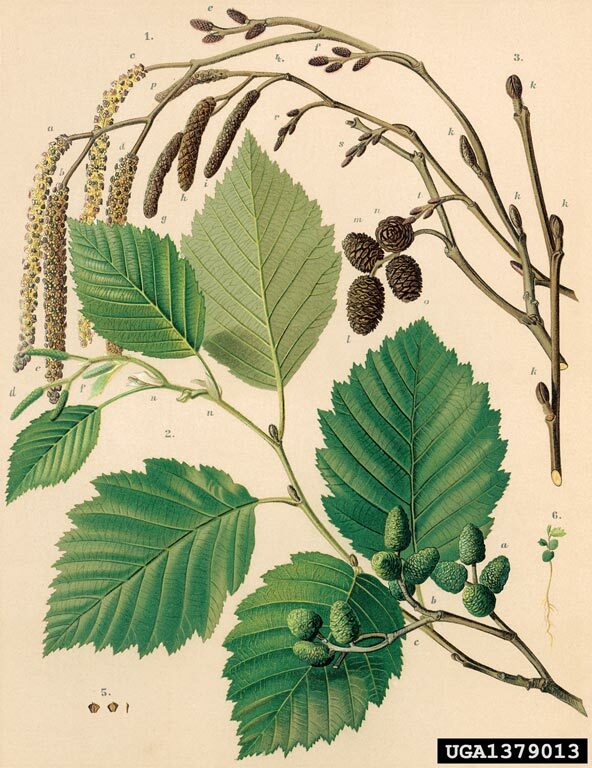 Notes: Alder roots are known to form a symbiotic relationship with an actinomycete bacterium of the genus Frankia forming nitrogen fixing root nodules (actinorhizae). These structures appear coral-like in form and allow alder to grow in very nutrient poor soils. Weakened plants may be attacked by Coral spot canker (Nectria cinnabarina), and other fungi (Sinclair et al. 1989).